Born to a poor family in Arkansas City, KS during a heavy snowstorm, Glen Jennings had a rough beginning in life. At age six he was diagnosed with rheumatic fever and his parents were told he had only one year to live. He later developed an enlarged heart and heart murmur but continued to excel in elementary school and high school despite working two jobs from the sixth grade on. During high school he worked the night shift at Grimes all night truck stop. “I was attracted to Cowley College (then known as Arkansas City Junior College) as it was in my home town and I could work the night shift while getting an excellent education,” Glen said. At ACJC, he was involved in "Future Teachers of America" an organization sponsored by Mary Margaret Williams. He went on to receive an Associate of Arts degree and teaching certificate from Arkansas City Junior College. He then began teaching grades 1-8 in a one room school about 15 miles southeast of Hugoton, KS and then in a one room school 25 miles north of Elkhart, KS until 1965. Jennings then served as a school administer for six years in Elkhart, KS. During all these years he went to summer school and night school at Oklahoma Panhandle University and/or Oklahoma State University. He received his MS and Ed.D. from Oklahoma State University. While raising three children with his wife, Sharon (Head), he taught at the University of MS, Texas Woman's University, and as Visiting Professor at California Family Study Center. He was also a Dissertation Evaluator for Saybrook Institute, Adjunct Professor at Texas Wesleyan University and taught for CDC in Dallas and the Texas Law Enforcement Institute. He also directed 119 dissertations, was published in over 25 journals, and co-edited one book. He received the Bowman-Moore Award from Texas Council on Family Relations, received the Top Hat Award from Business & Professional Women’s Organization, received a Life Time Achievement Award from Texas Association for Marriage and Family Therapy, and Cornaro Award as outstanding teacher from Texas Woman’s University. He conducted over 1,000 workshops and seminars and trained many family therapists on a range of topics before retiring on May, 2014 after 59 years of teaching. Dr. Jennings left such a mark on the people he worked with that there were three receptions held at his retirement, one in the Human Development Building hosted by the Department of Family Sciences, one by the University held in Stoddard Hall, and one by students at Stagecoach Ballroom in Fort Worth, Texas. Dr. Jennings and his wife, Sharon, moved to Grand Junction, Colorado in May of 2014 as their son, Dr. Eliot Jennings teaches at Colorado Mesa University and their daughter Robin Palmer works in the schools of Highland Ranch, Colorado. The couple’s oldest daughter, Mary Ellen Jennings Pearson, lives in West Point, Mississippi. Dr. Jennings has other connections to Cowley College as his cousin, Loye Sparks, played basketball at Cowley and on Feb. 21, 1961 scored a school-record tying 49 points against Pratt Community College. While his nephew, Steve Jennings, has a son named Stephen that was a member of the Tiger baseball team that won the JUCO World Series title in 1998. Along with their three children, Dr. Jennings and his wife, Sharon, have 15 grandchildren and four great-grandchildren. Dr. Jennings recently had an opportunity to cheer on the Tiger baseball team when they qualified for the JUCO World Series in Grand Junction, CO. 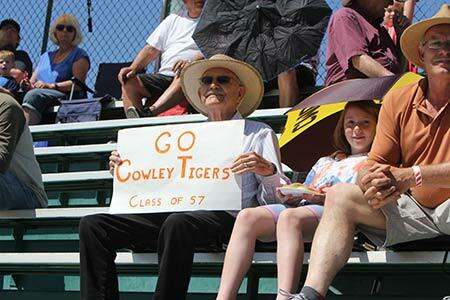 He enjoyed supporting Cowley at the JUCO World Series and was quite proud of their performance as they gave the two teams that played for the championship their toughest competition. Dr. Jennings plans to have t-shirts printed up to throw to the crowd prior to Cowley’s next appearance at the JUCO World Series. The shirts will say “Cowley College a Good Place to get a Good Education”. Nearly 60 years after graduating from Arkansas City Junior College Dr. Jennings looks back fondly on the instructors at the school, including Dr. Dan Kahler, Allan Maag, Dean Galley, and Miss Mary Margaret Williams. “Miss (Mary Margaret) Williams motivated me to be the best teacher I could become. Consequently I fell in love with every student I taught,” Dr. Jennings said.